When I thought about the book coming out, I was primarily excited for two things -- to see it on the shelves of libraries and in bookstore displays. At both, I intend to stand close to the book, either remarking on its singular ability to change your life or suggesting that candy is hidden inside. 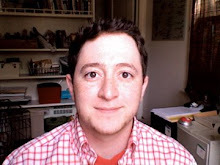 This morning brought an unexpected surprise via e-mail, which I would be remiss if I failed to express the odd mix of excitement and anxiety that sprang forth from yours truly. 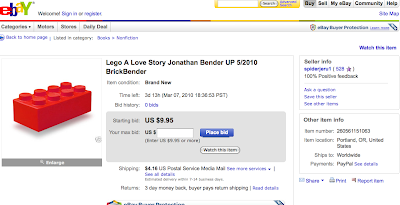 You, singular reader in Papau New Guinea (hello, by the way), can own your very own advance proof of LEGO: A Love Story -- courtesy of the good auction people at eBay. So take a break from bidding on porcelain unicorns and Jonathan Bender jerseys to bid on the book -- there's free candy hidden inside.